History of Glens Falls' "Great Fires"
As you read about the history of some of Glens Falls' most iconic buildings, you may notice a theme: almost all of them were constructed after 1864, with many being erected after 1902. Since the settlement of Glens Falls (originally called "Wing's Falls) dates back to the mid-1700's, it raises the question, "Why aren't there more buildings in Glens Falls that date back to the late 1700's and early 1800's?" The answer: fires. Glens Falls went up in significant flames not once, but three times between 1864 and 1902, effectively wiping out most of the city's older buildings. Read on to learn more about each of the fires. The New York Times reported it as "The Great Fire at Glen's Falls," while the Glens Falls Messenger proclaimed it was "one of the most destructive fires that ever happened in any village in the Northern States." On May 31, 1864, a fire broke out in the kitchen of the Glen's Falls Hotel, which today would've been located where Hudson Avenue enters Centennial Circle, according to The Post Star. The fire spread quickly, consuming virtually all of the buildings in the downtown area on Glen, Exchange, Ridge, and Warren streets. In total, 112 predominately wooden buildings met their demise in the fire, and the full damage was estimated at $1 million in 1864, or $14.9 million in today's dollars. Only three downtown buildings withstood the destruction. 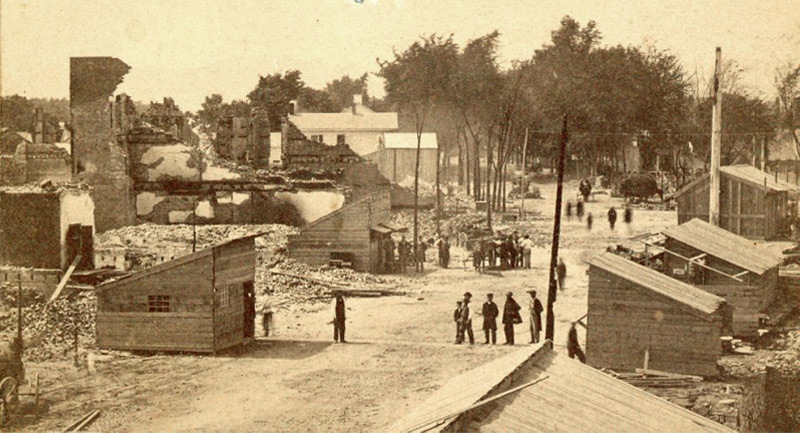 Some of the most notable buildings to be destroyed included, "the Glen's Falls Hotel, the Mansion House, the Glen's Falls and Commercial Banks, the Presbyterian, Methodist, Baptist, and Universalist Churches, the offices of the Republican and Messenger," and all but two of the "stores and shops in the village," according to an 1864 report from The New York Times. 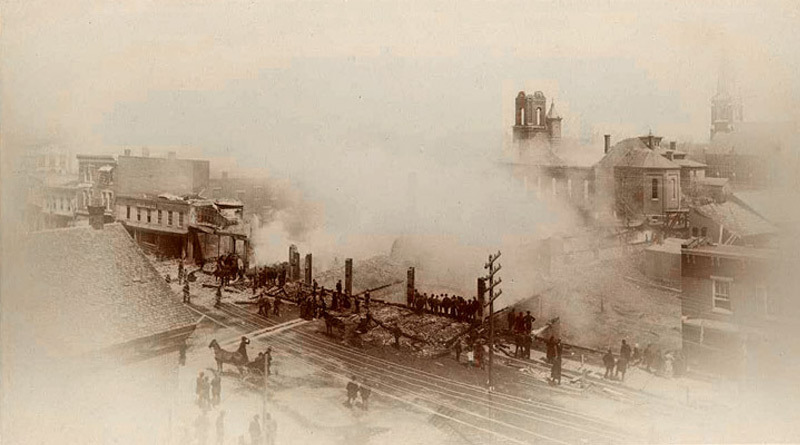 Although architectural standards were changed after the devastating 1864 blaze, and many buildings were re-built with concrete and bricks instead of wood, another fire broke out on April 28, 1884. The Post Star reported that this second blaze began at "W.H. Guildersleeve's Union Hall at the top of Glen Street hill," and spread from there. Among the buildings damaged or destroyed in this blaze were the Union Hall and the Cosgrove Opera House, a number of buildings and houses on Maple Street, and the Glens Falls Opera House and Presbyterian Church on Warren Street. The fire also tore through "a row of saloon buildings known as 'Murderer's Row.'" By this time, a municipal water system had been established in Glens Falls as a means of efficiently putting out fires. Even so, a third blaze started on April 26, 1902. This fire began at Webb Brothers Clothing and Furnishing Store, which was then located at 146 Glen Street. When it was finally put out, 16 businesses on the west side of Glen Street had been destroyed, some of the more notable of which included the Glens Falls Daily Times publishers and the Joseph Fowler Shirt & Collar Co. Although the fires were devastating, the resiliance of Glens Falls was proven by its residents' determination to rebuild after each blaze. Some of the most positive outcomes of the fires include the establishment of a municipal water system and the improvement of building standards. To learn more about Glens Falls' Great Fires and their impact on the city's architecture, contact the Chapman Museum or the Glens Falls Fire Department's historian. All photos provided by the Chapman Historical Museum.